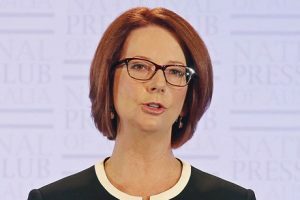 Parents will have the right to request part-time work when they return from having a baby under changes to workplace relations laws, Prime Minister Julia Gillard says. Ms Gillard says the government wants to take some off the burden off modern families who are struggling to balance work with caring for children and sometimes elderly relatives. Labor will seek to legislate as soon as possible to allow parents to request a return to flexible and part-time work as it works through the recommendations of its review of the Fair Work Act last year, she says. “And their employer will have to respond to that (request),” she told reporters in New Zealand on Sunday. About 80 per cent of requests were satisfactorily resolved, but Ms Gillard said formalising the right would make employees more comfortable asking and the legislation would apply to mothers and fathers. She said the government would deal with the second tranche of announcements this week and flagged further changes later in the year. “The focus this week will be on that part of the workplace relations agenda which is really about work and family life,” she said. The prime minister said the government would also discuss some protections for roster changes and the onus on employers to consult their workers ahead of any changes.